It’s a wrinkle in tone. The messages are solid, but the fantasy is a little cheesy and the execution is a little clunky. In a special introduction shown to advance screening attendees, director Ava DuVernay described her big-screen adaptation of Madeleine L’Engle’s A Wrinkle in Time as a love letter to young people and the young at heart. She said her goal was to surface her inner 11-year-old and help audiences do the same. Those ambitions put this PG-rated movie in a certain context, but they don’t excuse the movie’s not-so-childish problems. Make what you will of DuVernay being the first black female director to helm a $100 million film production. She is no doubt a talented force, but prior to Wrinkle, her biggest splash was Selma, based on a true story about Dr. Martin Luther King. The two movies couldn’t be more different in tone, style and aspiration. DuVernay’s success in Selma doesn’t necessarily portend success in the fifth dimension. A lot of what’s colorfully splashed across the screen probably would’ve worked more magic in 1962, when the children’s book (the first in a series of five) was first published. (And that book begins with the old cliché, “It was a dark and stormy night.”) The movie is set in contemporary times and sports a contemporary attitude, fully loaded with modern messaging in a rainbow-colored, multi-cultural America. It’s hard to argue with magical characters like Mrs. Which (Oprah Winfrey, The Color Purple), Mrs. Who (Mindy Kaling, TV’s The Mindy Project) and Mrs. Whatsit (Reese Witherspoon, Walk the Line) espousing sage, timeless advice about inclusiveness, hope and being yourself. Embracing the gift of your faults is advice well-taken for all ages. However, trite feel-good bumper-sticker slogans like “Be a warrior” and “Be glorious” sound great within the context of the Wrinkle environment, but not so much once the theatre confines have been exited. And then there’s this mumbo-jumbo sci-psych: Find the right frequency and have faith in who you are. Okay. Attempting to tune in right now. That “frequency” refers to a scientific theory developed by Alex Murry (Chris Pine, Star Trek) and his wife, Kate (Gugu Mbatha-Raw, Belle). They posit one can travel into the fifth dimension with nothing more than the mind. It’s a theory that’s dismissed with laughter at an academic presentation, but the jeers don’t dissuade Alex from his pursuit of scientific advancement. Finally, at his spacious Los Angeles house, in his lab, Alex finds his “frequency” and disappears. 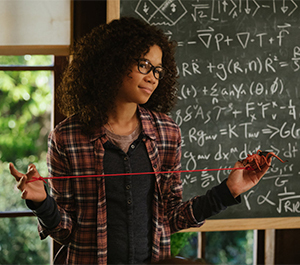 It’s one more source of teasing from the school bullies, who pester Meg Murry (Storm Reid, 12 Years a Slave) at every opportunity. Alex’s disappearance brings on a message of keeping hope alive. And that message is brandished ever-so-strongly by Meg’s younger brother, Charles Wallace (Deric McCabe, who made an appearance in Stephanie, an Akiva Goldsman movie not many people know exists). Charles Wallace (he’s always referred to as “Charles Wallace,” never Charles, never Chuck, never CW, always Charles Wallace) basically appears out of nowhere one day, kind of like the stork dropped off a full-grown kid on the Murry porch. Let the clunkiness begin. Charles Wallace is precocious and Charles Wallace is also kinda creepy. But part of that is no doubt a factor of McCabe’s lack of experience on screen and in life. He doesn’t have the emotional range and command of his voice inflection to demonstrate a dramatic range; he’s too young and DuVernay simply doesn’t have the command of child actors like Spielberg or Scorsese or Burton. It doesn’t play right when Charles Wallace is out on the playground shouting out to his sister, “You have more potential than anybody here!” Who is this kid? What’s his deal? His very existence is so strangely handled within the movie, his screen presence is more mystery than mystical. It’s Alex who becomes the catalyst for the three spirits to enter Meg’s life in an effort to rescue her dad and save the universe from the “IT” (not to be confused with the clown in the sewer, mind you). The “IT” is pure universal darkness that transmits evil, which in turn fuels jealousy, suffering, pain, despair and insincerity. Darkness moves faster than light and time is running out. All the best and most enduring children’s movies — including classics like The Wizard of Oz and Willy Wonka & the Chocolate Factory — contain a certain amount of creepiness and scary moments. Here, the creepiness is less intentional and more a by-product of some questionable acting choices. It doesn’t help so much of the action that introduces the three spirits and that sets the stage comes across as so random. It’s a leap of faith along the lines of Field of Dreams, albeit to a more chaotic effect, with magical things happening for no other reason than to drive the action toward the next serendipitous event. At its best, Wrinkle manages to generate a vibe of suburban magic akin to E.T. — but those moments are overwhelmed by a tonal distortion made all the more disappointing considering the screenplay was co-written by Jennifer Lee, whose credits include Zootopia and Frozen. There’s more to creating a sense of wonder than to have characters stand agape as they bask in the marvels of CGI environments; it’s an artful mix of acting, music, effects, dialogue and sets that’s challenging to master and given short shrift in current filmmaking trends. As for all that serendipity, Charles Wallace appears on screen in an all-of-a-sudden fashion, as do the trio of spirits — and throw in a kid named Calvin (Levi Miller, Pan), who’s apparently there to look semi-adoringly at Meg while also carrying the burden of an unhappy home life driven by a demanding father. Those spirits are a mixed bag. Mrs. Whatsit’s a flake. More interesting is Mrs. Who, who quotes famous authors, poets and politicians from around the world, representing a diversity of thought. As for Mrs. Which, Winfrey plays the most-knowing of them all — and her placement in that role comes across as perhaps too high-minded and agenda-driven. L’Engle was an interesting person, an author who wrote children’s books based in fantasy as a platform to merge her Christian faith and interest in science. A Wrinkle in Time as a movie offers a lot of interesting ideas as well, but this adaptation seems destined for the same relatively limited appeal as the Chronicles of Narnia film series pulled from C.S. Lewis’ classic books. Given its scientific premise — a tesseract, or a wrinkle in time that allows travel through the fifth dimension — and its creative expression of individuality, the movie comes up disappointingly short on the STEAM side. The clumsy introductions of the characters is matched by the clunky climax, in which key characters disappear then reappear — it all gives the impression the filmmakers collectively gave up on the story’s own logic and simply jumped to the end. Like a wrinkle in time.